There are times in .NET development when you may find it necessary to execute a command line program and grab the results. Using the Process class from the System.Diagnostics namespace we can develop the following Windows Form application to display the results of command entered in a TextBox control. The first step is to create a class to encapsulate the work we do with the Process class. Many of the concepts used in this example are followed up with links in the Resources section of this article. 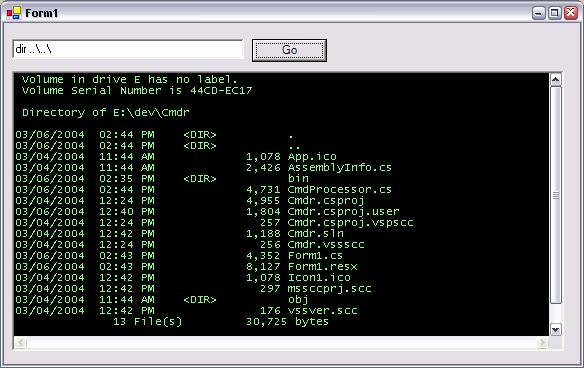 /// Execute takes a command string to pass as the arguments to cmd.exe. /// The command to execute. // Initializes a ProcessStartInfo for the Process. // output has arrived on either standard output or standard error. // finish the asynch call, and if text has arrived raise an event. // all the outout has arrived. Using the above class from a Windows Form requires the following code excerpted from a Form. The most important part of the code is to make sure a TextReceived event marshals back to the UI thread before updating the Text property of the txtOutput TextBox object. You can download the code as a VB.NET project.